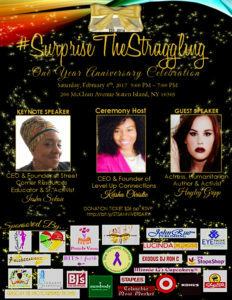 STATEN ISLAND, NY—January 30, 2017—JRUEPRLIAISON— The first Annual Celebration for #SurpriseTheStruggling, Inc. being held on Saturday, February 4th located in Staten Island, NY at the American Legion on McClean Avenue, is a gala event to celebrate and highlight the success, diligence, and hard work of the human services organization’s staff, ambassadors, and volunteers this past year. A catered dinner, specialty drinks, and honors with special guests will highlight the evening’s affair. Surprise The Struggling, Inc. has made a huge impact in the area of human services this past year. STS, 501c3 nonprofit organization major consumers are homeless women and teen girls. Throughout the year, under the guidance of its founder and Executive Director, Dr. Jacquelyn Wilson—staff, ambassadors, and volunteers have managed to secure and donate over 5,000+ bags and purses filled with toiletries. The items donated and given to various homeless women and teen girls, in addition to hosting surprise baby showers, birthday parties, back to school parties, and off to college parties for those in shelters and in need. The night’s overall event—that is expecting 80 guests, and some very special VIP’s, who will be honored during the night’s celebration—is being hosted by POYED by Velvette, Pinking of YOU Events & Design, LLC. http://www.poyedbyvelvette.wixsite.com/boutique-events Special thanks to, Velvette Mattison-Batson, I.E.W.P of POYED by Velvette for also donating event planning and coordination services for the STS One Year Anniversary Celebration. STS gives special thanks and acknowledges all of their Sponsors that made the upcoming gala a possibility. Without the generosity and support—not just for this Saturday’s coming event but also throughout the year—Surprise The Struggling would not have been able to help so many. Gratitude is extended to those who donated in person and online at the website, both monetarily and materially. Continuing their thanks: to Mitchell BG Harper, for the event space to hold the gala; to Lisa Sumpter and Linda Sumpter of Sister Prison Wives BFF, www.spw-bff.org, for Auction Baskets to raise funds for the upcoming STS calendar year. To local caterer, Leonard Bishop of, A Family Affair Party Planners & Catering, bit.ly/AFAMILYAFFAIRCATERING for providing and creating an unforgettable and dynamic dining experience for the guests to enjoy. Thanks to videographer and photographer, Gregory Thomas, for providing special photography for the gala. Thanks to, Edna Lugo of, Cocktail Vixens, www.cocktailvixens.com, for creating a signature cocktail for the evening and providing mobile bartending services. For table design and centerpieces, thanks to Chanae Duncan of Eye Imagine Everything. Thank you, Balloons Décor, B For all Occasion of Brooklyn, for providing decorations and backdrops. Thank you, Wanda Edwards, of A Walk in Her Shoes, bit.ly/AWALKINHERSHOES, for the provision of special material, Ruthe McDonald of Johnrue Publishing www.ruthemcdonald.com for copywriting and PR services. Gratitude is extended to, DJ Ron C of Exodus Entertainment bit.ly/ExodusDJRonC, for providing the evening’s music and Minnie G’s Cupcakery for providing dessert. To local business, Roc A Natural www.rocanatural.com and from California, Sumbody Skincare, www.sumbody.com for providing toiletries and body products for gift baskets to be given away. Special thanks to, Lucinda Cross, at www.lucindacross.com and Nichole Bailey of www.bitsoffaith.net for sponsoring attendees. Also, thanks to, Eloquent Essentials www.eloquentessentials.com for their invaluable contributions. Very special thanks to the volunteers for that day, whose dedication and diligence are applauded. Also, to the following proprietors of the local community for their generosity: Stop N Shop groceries, Columbia Meat Market, Kohl’s, BJ’s Wholesale, Staples, Target, and Shoprite. The continued support and generosity of partners, sponsors, donors, ambassadors, and volunteers has helped make Surprise The Struggling’s first year of service a phenomenal year of unbelievable achievements and success. STS—through their Ambassador program—were able to achieve their #STSGLOBAL campaign goal by reaching Canada, Haiti, Africa, and Jamaica. They are looking forward to an even greater year ahead and years to come. There are a few tickets still available to the public. Please check the website for information. Previous PostPrevious Come Celebrate Our One Year Anniversary!